Despite the many self-service tools available online and via phone, most customers still prefer talking to a person—especially if they have a problem. Our certified Customer Experience Management Professional (CEMPRO℠) training will improve the quality of service your customer-facing employee provide. It will give them the critical soft skills they need to deliver an outstanding customer experience, whether their role is in customer service, phone-based tech support, field service, or help desk. This will lead to increased customer loyalty and profitability. Whether it's the customer service organization, technical support group, or another customer-facing team, these frontline employees will have the tools they need to have your business acquire, grow, retain, and even win back customers. CEMPRO training for corporate team leaders and advisors/consultants complements the training designed for their customer-facing direct reports. This enables team leaders responsible for implementing customer satisfaction programs—and the consultants advising them on customer experience strategies—to build uniform best practices for their teams. The comprehensive CEMPRO curriculum includes such topics as customer experience and customer care strategies, dealing with difficult customers, problem solving, and time management. View our demo and learn how our unique, certified customer relationship training can make your organization a leader in service excellence. A first-of-its-kind training program, CEMPRO certification demonstrates mastery of best practices and uniform standards of excellence that apply to implementing and managing customer satisfaction and loyalty initiatives, as well as the employee engagement approaches integral to them. There are two parts to the training and certification. One is specific to corporate team leaders and advisors/consultants; the other, to customer-facing staff. The training ends with a certification exam. Those who pass it will receive a certification logo they can use on their business card, social media profile, and the like. The CEMPRO curriculum for Advocates (corporate executives and CX consultants) is based on our proprietary 12-step CEMDNA Playbook Strategy. 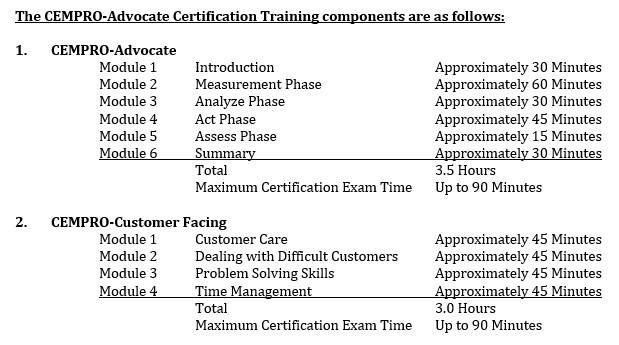 The training consists of two components: the CEMPRO-Advocate training and the Customer-Facing Group curriculum. The CEMPRO-Advocate training provides reviews the key components of a world-class customer experience management program and the CX strategies needed to operate it successfully over the long term. As part of the certification program, Advisors are also required to take the Customer-Facing Group curriculum on customer relationship soft skills training. The training provides instruction on how to build exceptional customer relationships, deal with difficult customers, conduct effective problem solving, and improve time management—all while driving improvements to customer satisfaction. Participating in this part of the training ensures that team leaders have experienced the same training as their direct reports, enabling them to ensure consistency through shared best practices. CEMPRO-Advocate certification requires a score of at least eighty percent (80%) on each of the two exams. Additionally, individuals must complete each exam in under 90 minutes. Participants who meet the certification criteria will receive an electronic notice of certification, as well as a CEMPRO logo they can display on their business cards, social profiles, and the like. There is also a certification option for frontline customer-facing employees. The Customer-Facing Group curriculum is web-based and consists of four modules: Building Exception Customer Relationships; Dealing With Difficult People; Problem Solving Skills; and Time Management. Certification is only available to teams; so, companies must enroll all of their customer-facing representative within each applicable group (e.g. customer service, help desk) in the training. Certification is conferred only if ninety percent (90%) of the participants receive a score of at least eighty percent (80%) on the exam, which they must complete in less than 90 minutes. Organizations that meet the criteria are licensed to use the CEMPRO logo in such media as their website, business cards, and service contracts for three years. CRMI will work with you to customize our curriculum to meet your specific needs, while still fulfilling the requirements for CEMPRO certification. We'll collaborate with you to develop interactive training and customer experience strategies based on real-life learning situations that meets the unique needs of your customer-facing employees. 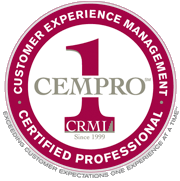 CRMI offers several programs that complement CEMPRO certification and allow you to showcase your customer experience and service excellence. Already have a customer relationship skills training program in place? Your organization may still be able to receive CEMPRO certification through the CEMPRO Certification Audit Program. CRMI will review the curriculum, course content, and exam that comprise your existing frontline training program and compare it against the corresponding CEMPRO components. Additionally, organizations will need to show that all individuals within each applicable group have participated in the training. CRMI will then determine whether your team meets our criteria for certification. Organizations that meet the criteria are licensed to use the CEMPRO logo in such media as their website, business cards, and service contracts for one year. CRMI provides an Annual Report Card For companies that receive certification through the CEMPRO Certification Audit Program. The Report Card verifies that your training curriculum, exam, and score all meet the stringent CEMPRO Certification requirements. The Report Card may also contain your audited customer satisfaction and loyalty survey results for the calendar year in which your organization achieved CEMPRO certification, if we conducted that audit. Established in 2012, the CEMPRO Award recognizes companies that have met all the CEMPRO certification requirements in the previous calendar year. These requirements include ninety percent (90%) of an organization's customer-facing service employees receiving a score of at least eighty percent (80%) on the exam. Through our company store program with Lands' End Business Outfitters, recipients of the CEMPRO Award can order apparel and other branded products sporting the official CEMPRO Award logo along with their company logo. Award recipients need pre-approval from CRMI before place orders.